Theater located inside the Boys and Girls Club—entrance is hidden behind the school buses! 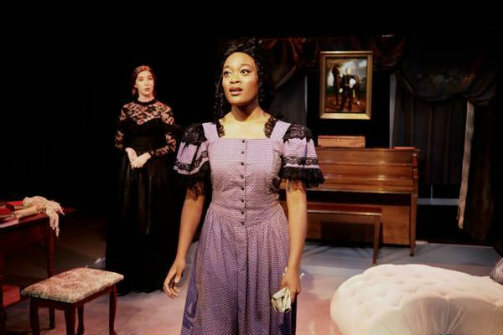 Maya Carter and Kaitlyn Schirard in Hedda Gabler. Photo by Kelley Shih. BOTTOM LINE: A streamlined and technically powerful production of the Ibsen classic. The great and powerful Hedda Gabler (Kaitlyn Schirard), the late general’s daughter, known for galloping through the countryside on her father’s stallions, has settled down. She has chosen to marry the safe intellectual George Tesman (David De Almo). In this canonical Ibsen piece, we meet Hedda and Tesman as they return from their long honeymoon. Hedda must now face her new role as mistress of this lavish house and wife to a man whose work is of little to no interest to her. Hedda will not settle for anything less than an exciting life, but how to get it? We find out in this production of Hedda Gabler, directed by Kelly McReady and playing at The Ophelia Theater in Astoria, Queens. When news comes that the elusive bad-boy Eilert Lovborg (Lebron Lackey) has returned to town, reformed and sober, Hedda is visibly excited. She's excited to rekindle an old flame; to cause drama between Lovborg and his scholarly partner Thea (Maya Carter), who has run away from her husband to be with him; and excited at the competition that Lovborg presents to her husband. Lovborg has written a ground-breaking book and is now sitting on an equally brilliant manuscript. Curiously, this play has been revived in New York by three other different indie theater companies over the last few months. I would not be surprised to hear that the scarcity of strong female leads in classic theater makes this an alluring piece for companies. However one aspect of Hedda Gabler that poses a challenge to directors is how to deal with the so-called “hysteria” that Ibsen was intending to write about. in Hedda Gabler, the now-recognized-as-incredibly-sexist term is unavoidable. In this production, McReady attempt to dampen Hedda’s hysterics and to show them only in very intimate moments between the scenes. In these moments, we are transported into Hedda’s mind thanks to the beautiful marriage of sound and light design. Hedda stares at a portrait of her father or indulges in some frantic mannerisms as she admires the fire. These beats are transporting and enhanced by the thrust stage layout, which made me feel as though I was not only a fly on the wall, but part of the wall itself, creating a safe enclosure for the dark schemes of Hedda’s mind. Other stylistic choices make this production different. The short 80 minute run-time, for instance, is made possible by McReady’s adaptation of the text, but also by her choice to overlap some dialogue. Though this does create a sense of unrest and tension at first, the repetition of this device is a little odd. Furthermore, the decision to have the actors’ speech affected is alienating and takes away from the production's attempts to reach a level of sincerity, one that is necessary for Ibsen to not come off as melodramatic. De Almo’s Tesman hits all the marks for being the clueless, lovable husband Hedda needs. Carter, who plays the impassioned Thea, is a grounded and sensitive actor. Within these period-specific constraints, titular actress Schirard finds some riveting moments of subtlety. Particularly her scenes with Judge Brack (played deftly by Glenn Stoops) offer a relaxed and lively back-and-forth. Schirard shines most, however, in her gradual shift to Hedda’s darker side, where she finds the control and power that make her life endurable again. Thanks to Schirard’s performance, I left the theater thinking about the courage needed to live life by your own rules, but also about the dangerously thin line between controlling one’s own actions and partaking in cruel acts of manipulation. Hedda Gabler is by Henrik Ibsen, adapted by Kelly McCready. Directed by Kelly McCready. Assistant Director is Theresa Buechler. Set Design is by Suzu Sakai. Lighting Design is by Kelley Shih. Lighting Associate is Abigail Wang. Sound Design is by Kelly McCready. Costume Design by Sara Fellini. Props Mistress is Amber Rizzo. Stage Manager is Morgan Yachinich. The cast is Kaitlyn Schirard, David De Almo, Glenn Stoops, Maya Carter and Lebron Lackey.